Oh my love. If I wasn't completely taken with you before this last month, I certainly am now. I blinked and the last 5 weeks sped on by. Boy have you been busy growing and learning this month. At your last doctor appointment at 9 weeks you weighed 12 lb. 13 oz . and measured 26 inches. Two weeks ago at GG and Papa's I weighed you at 14 lbs. 9 oz. Mommy wanted to get your measurements today, at 13 weeks (I'll spare you the saga) but it's going to be a little bit until I have an opportunity to weigh you again. My guess is you're somewhere around 15 lbs. We shall see! You continue to fill out and I just love your little breastfed baby rolls. You have been wearing 3-6 mo. clothing for a while now and have already worn several 6 mo. + outfits. When I manage to open your still stiff fists I tease you about letting them air out a bit (pee - u) and give your palms kisses. I am still loving that crazy head of hair you have although I haven't the slightest clue what to do with it. You have developed a bit of cradle cap and I think it's taking some hair with it when it falls out (womp womp) because I've noticed your hair thinning out a bit. It's also lightening up a little and is a lot like mine. The top continues to grow and hasn't decided if it should be curly or straight yet. This month you have developed in leaps and bounds. You spend a lot of time on your tummy and when you're there you rest on your chest and stick your head as far up as you can. Sometimes you move your legs like you want to crawl so I put myself up to your feet so you have traction and something to push off of. You've become a bit of a wiggle worm as evident by the picture below. You are the most comfortable sleeping on your side and now you spend a lot of your wake/play time that way too. You twist your body around and are so very close to rolling over! This would be the most exciting thing ever except you get your best practice in while Mommy is trying to change your diaper. It makes for quite the challenge because you are incredibly strong! We knew that by how firm your grip was but now you bear weight on your legs and abdomen. GG bought you a Bumbo and you've been sitting it nearly every day for the last two weeks. 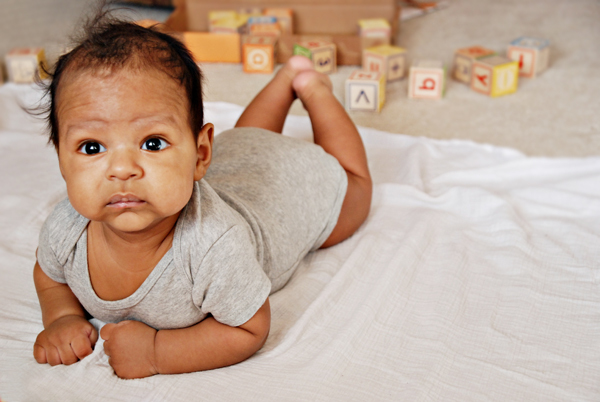 Your balance is pretty good now and you can already sit up on your own for several seconds at a time! A couple of weeks ago you found your hands in a big way! You have begun reaching for things that you want provided they are right in front of you. You immediately bring your prize to your mouth. You're obsessed with [loudly] sucking on your fists and spent a couple days last week sucking on your forefinger then two fingers at a time. You are forever cracking me and Daddy up with what interests you. 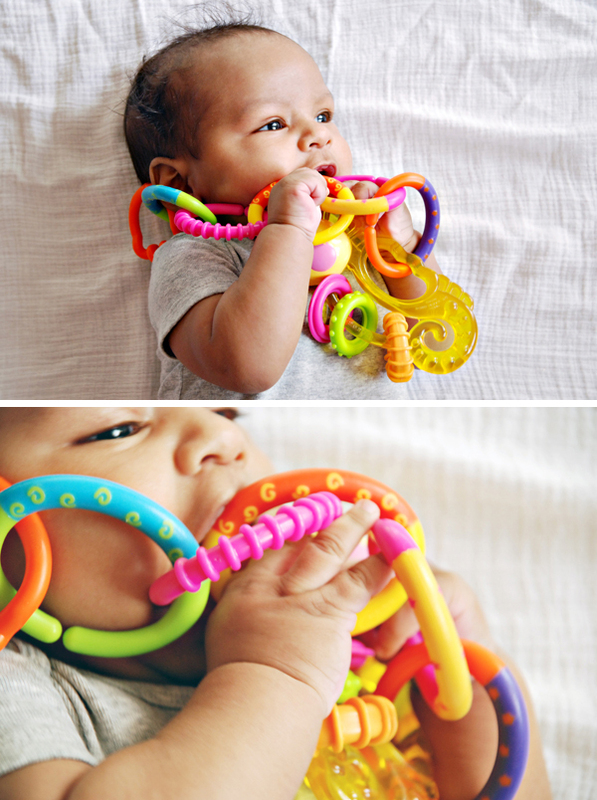 These rings and seahorse are definitely your favorite and most entertaining toy. We've been taking them everywhere these days to appease you. 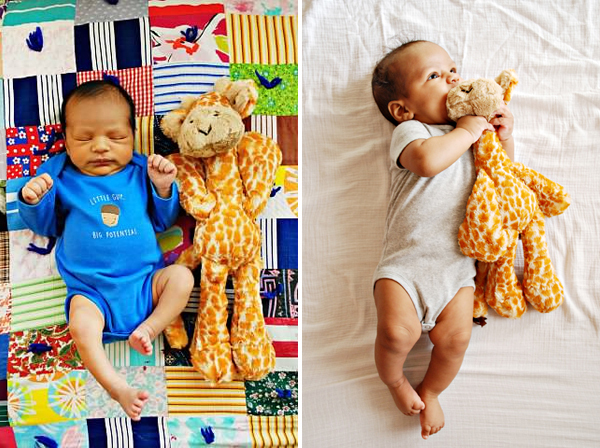 Your other current favorites are your Teddy lovey from Nana and Giraffe from Auntie Heather. Whenever I hand either of them to you, you immediately put them in a choke hold bring them to your face and begin sucking on them! Haha. They're nice and crusty now thanks to your slobber. I think that's just the way you like them. The last week has been tough because you're going through a growth spurt. Mommy wasn't sure what happened when all of a sudden you became Mr. Cranky Pants, were eating constantly, and not sleeping even though I knew you were exhausted. Some Mommy friends of mine pointed out that at twelve weeks you're expected to go through a growth spurt. I've more or less had to embrace it to keep my sanity but that means co-sleeping most of the night so that I could breastfeed you side lying pretty much nonstop. I'm not gonna lie - I'm kind of exhausted and definitely looking forward to moving past this stage. Nonetheless, we have celebrated many nights of you sleeping 3, 4, even 5 hours at a time. The sleep when you first go to bed is always the longest span and then you wake up two or three more times a night to nurse (all rules go out the window when you're busy growing). Something we are [*mostly] loving is your voice! You've been experimenting with it a LOT lately. 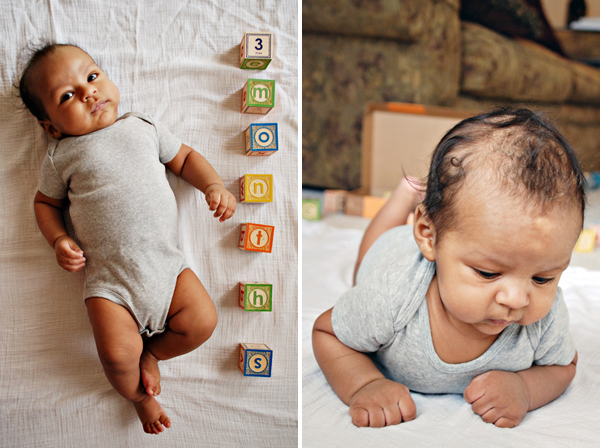 You started off by cooing, "Oooh" and "Agoo". When we would repeat and encourage your talking you would get incredibly excited! Then one night about a week ago Daddy said something that made you laugh out loud! It was music to our ears and so very exciting! I was so happy that we were both able to hear it. Thank you for that. You've only laughed like that a couple of times so far but I love it. I think our reactions have encouraged you because you've taken to SCREAMING. I've always noticed your tendencies to screech, squeal, and scream but this is something new entirely. *I said mostly earlier because this scream of yours?? It's a wonder CPS hasn't been called already. You don't know anything about Jurassic Park yet but you sound somewhat like a Velociraptor. You're happy yelling at us all day long in this high pitch scream! In fact, I was just telling Daddy how you woke me up this morning by screaming in my face only to grin from ear to ear when I opened my eyes. You crack me up, son. 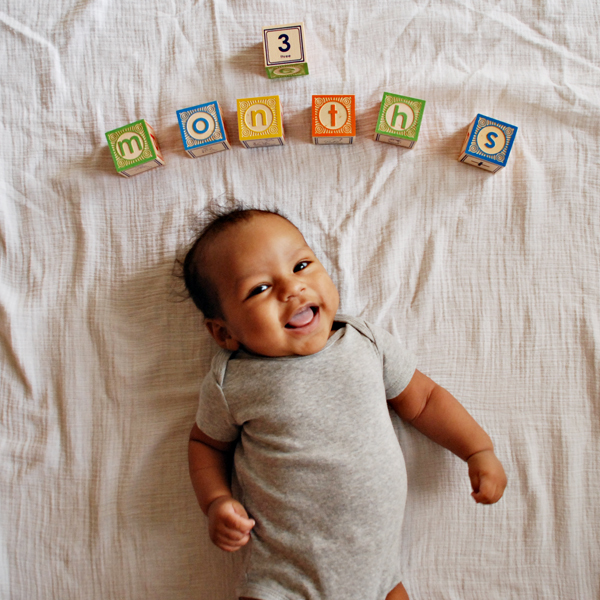 This month you had your first stroll outside and we've since gone for several walks around the neighborhood or park. You've also had two play dates already with friends right around your age. You flew on your first plane and were absolutely perfect! We reunited with Daddy and moved into our new apartment in Atlanta, Georgia. Mommy and Daddy got married!! This month has been so full of love and happiness and you're at the center of it, sweetheart. 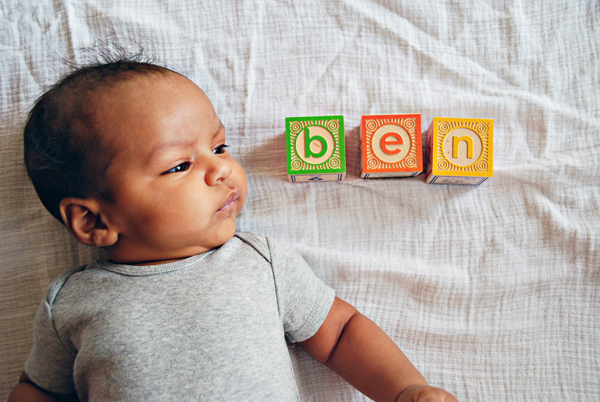 God has truly blessed us with a beautiful, healthy son who brings us so much joy. You are such a good, happy baby. You're very serious and observant but definitely have that giggly silly side (it mostly comes out in your time with Daddy). We're settling into a nice little routine here. I love that you have your special things and ways with me and Daddy. You make your mama feel incredibly loved.